Gift-Giving Season is Right Around the Corner! 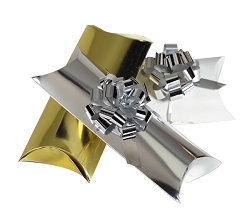 Let us help pick out the perfect gift certificates for your spa, or salon! Clients love to share their favorite spot for a great service! Why not add a little style to your certificates with these cute, and stylish holders! 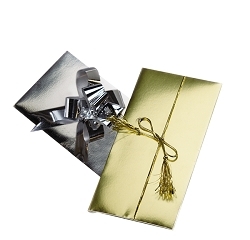 Purse Style Gift Certificate Holder with Ribbons are a great way to showcase your style! Choose from Silver, Gold, or even Leopard! Going for a more natural look? 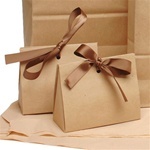 We also carry Kraft gift certificate holder with a satin brown ribbon. Perfect for offering a unique, natural presentation. Need Something a little more distinctive? 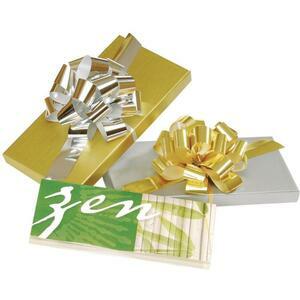 Add some elegance to your certificates with a Gold Gift Certificate Box! Decorate with your custom label or hangtag, and accent with a matching bow!